Main Island- East Coast- (Morning) Locke is leading the Others to Jacob from their beach camp. Locke asks Ben why Ben hasn’t told Richard of his plan to murder Jacob. Ben tells Locke about how Alex said she would destroy him if Ben did not do everything Locke asked of Ben. Locke appears not to know about this. Ben tells Locke he will do anything Locke asks of him, regardless of what it is. Locke tells Ben that Ben must kill Jacob. Hydra Islet – (Morning) Ilana, Bram, Burnett, Wolfe, and Salinger leave Hydra Island via the blue (two pontoon) outrigger. They are traveling with a large metal box containing the true Locke’s body and an unconscious Lapidus. They are traveling to the Main Island to visit Jacob at his cabin. Main Island- Jungle- (Day) Ilana and her group carry the box towards the Jacob’s cabin. 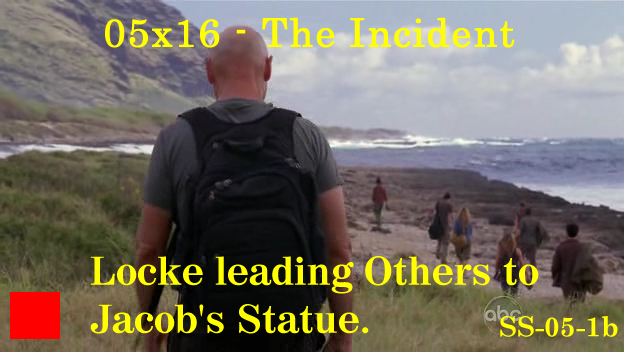 They need to show Locke’s corpse to Jacob so he will know what he is up against. They are up against something a lot scarier than Locke’s corpse. They call themselves the good guys. 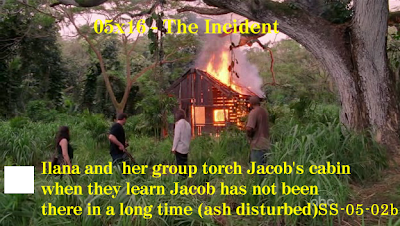 They arrive at Jacob’s cabin. There is a trail of ash surrounding the cabin with a break in it. Ilana enters the cabin. Ilana still has a bandage on her left hand. Jacob’s cabin- (Day) Ilana enters the cabin. She finds a long blade piercing a cloth to the inside cabin frame. She knows that Jacob has not been there, nor has she has been for a long time. Someone else has been using the cabin. They burn it. The cloth from the cabin depicts the four-toed statue. That is where they will go. Main Island- Beach Camp- (Day) Locke is leading the Others towards Jacob. 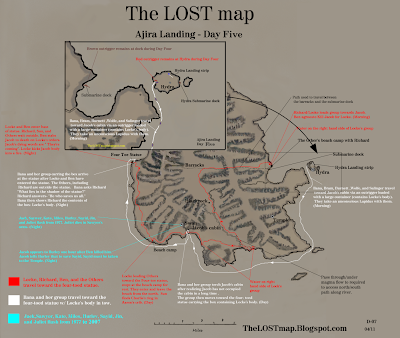 Locke tells the group that Richard Alpert told him they should get to where they are going by nightfall. They should rest, as they will need it for what they are about to do. Locke and Ben talk alone on the beach. 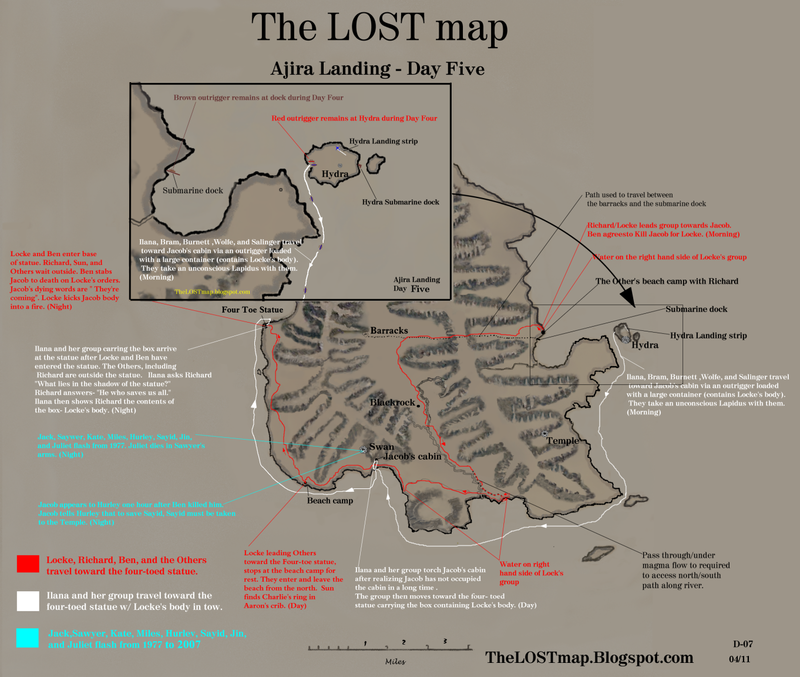 They appear to be at the Losties camp. Locke points out the hatch door. Ben tells Locke when they first visited Jacob in the cabin; he was pretending to see Jacob. He was just talking to an empty chair. Ben was just as surprised as Locke when things started flying around. Ben was embarrassed that he had never seen Jacob. Ben told Locke he lied, that’s what he does. Locke explained to Ben why he thinks Ben should want to kill Jacob. Sun finds Charlie’s ring in Aaron’s crib. 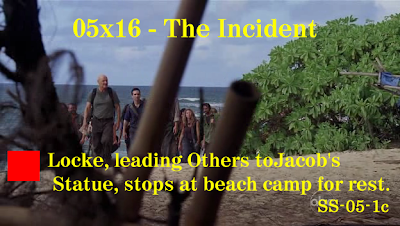 Main Island- Jungle- (Day) Richard Alpart, Locke leads Others toward Jacob. They come to the four-toed statue. Locke does not understand what the foot has to do with Jacob (is he lying?). Richard tells Locke it is where Jacob lives. Four-Toed Statue- (Night) The Other’s make camp outside the statue. Richard tells Locke if he waited, Jacob would have come to him. Sun asks Ben what happened to the rest of the statue. Ben doesn’t know. Sun doesn’t believe him. 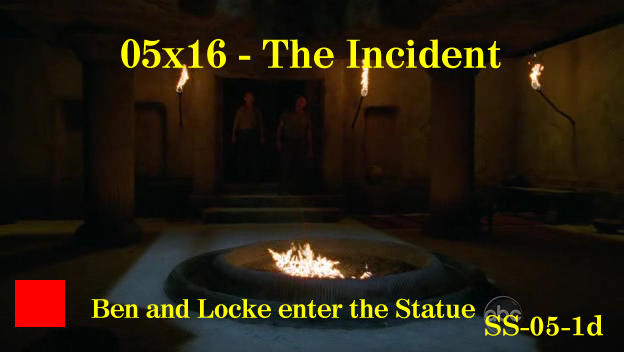 Ben, Richard, and Locke enter the statue base. 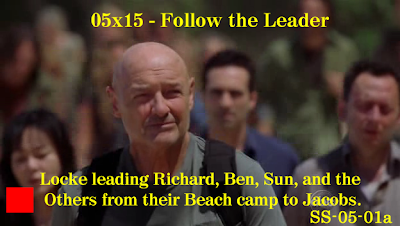 Richard tells Locke that Ben can’t enter, only the leader can. Locke demands that Ben be allowed to enter. Richard acquiesces. Richard opens a secret entrance, but does not enter. Locke and Ben enter. Locke tells Ben things will change once Jacob is gone. Locke gives Ben a knife. Four toed Statue- (Night) Richard Alpart and Sun talk outside the statue base. Ilana and her group approach with the box. Ilana asks ‘Who is Ricardo?’- She then asks Richard ‘What lies in the shadow of the statue?’ Richard answers in Latin ‘He who saves us all’. 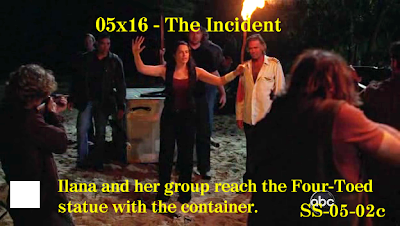 Ilana opens the box and shows Richard Locke. Ilana says he was in the cargo hold of Ajira 316 in a coffin. Jacob answers “What about you?” Ben stabs Jacob. Jacobs dying (?) words are “They’re coming”. Locke kicks Jacob into the fire. Jungle close to Swan- 2007- (Night)- Kate regains consciousness while clinging to a large branch in a high tree. She has temporary lost her hearing. Kate climbs down and finds Miles, who also has lost his hearing. Kate finds the Hatch door and subsequently the Swan explosion that Desmond initiated. They are back in 2007. 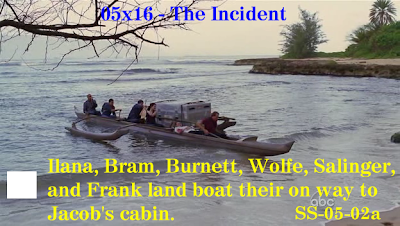 Kate finds Jack and Sawyer unconsciousness at the boundary of the hole that resulted from the Swan explosion. 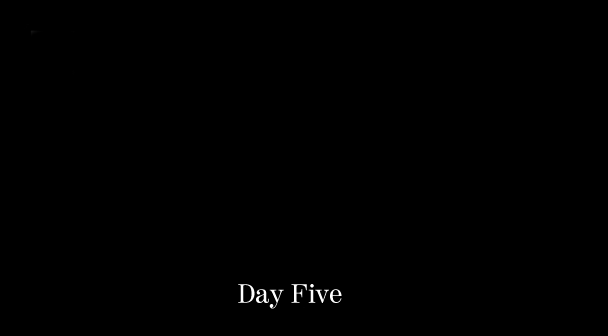 Jack regains consciousness and Sawyer (who regained consciousness off camera) kicks Jack into the hole, blaming Jack for Juliet’s death. Sawyer claims Jack was wrong for dropping the bomb into the hole. Jungle close to Swan inside Dharma van- (Night) Hurly, Jin, and a dying Sayid are together in a Dharma van. Hurley- “What just happened?” Jin- “I think we moved through time. 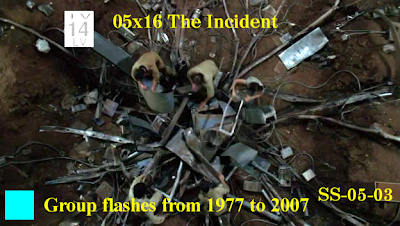 White flash, headache, happened to me before.” They are close enough to the Swan to hear Sawyer yelling at Jack. Jin leaves the van for the sound of the voices. Jungle close to Swan- (Night) Jack- “ The bomb must have gone off.” Sawyer-“You think if an atom bomb went off we would still be standing here?” Jin appears at the top of the excavation and tells Jack that Sayid needs his help. Sayid is with Hurley at the van two minutes away. Sayid is still bleeding. Kate hears Juliet crying for help. Jungle close to Swan inside Dharma van- (Night) – Hurley is alone with a dying with a dying Sayid. Sayid knows he is going to die and knows he is going to hell. Jacob appears to Hurley. Four Toed Statue- (Night) Locke and Ben are inside and Locke cuts a piece of Jacob’s cloth with Jacob’s knife. Ben used this knife (covered in blood) to kill Jacob. Locke tells Ben Jacob is dead. 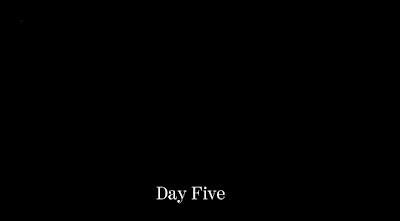 Locke tells Ben that Jacob didn’t fight because he knew he was beaten. Locke directs Ben to Summon Richard (who is directly outside). . Ben exits the statue and tells Richard everything is all right (a lie) and tells him that Locke wants to speak to him. Richard grabs Ben and forces him to see the dead Locke that Ilana and her group carried from Hydra. Swan Hatch- (Night)- Jack, Kate, Sawyer, Miles, and Jin attempt to reach Juliet. They need to remove a heavy beam, which requires a wench from the Dharma van. Jin runs for the van. Jungle close to Swan inside Dharma van- (Night)- Hurley and Jacob talk. Jacob talks Hurley that he died an hour previous. He tells Hurley that his death was the result of an old friend who tiered of his company. Jacob needs Hurley to save Sayid. Jack cannot save Sayid, only the temple can. The rest of group will also be safe at the Temple. Hurley must also carry the guitar case. Jin appears and directs Hurley (using the van) to the Swan to help remove a beam that covers the Swan. Sawyer vows to Kate that if Juliet dies he will kill Jack. The group use chains/wench to remove a beam trapping Juliet. Swan Hatch- (Night)- The beam obstructing the Swan is removed by using the wench of the Dharma van, allowing Sawyer to reach Juliet. Juliet is alive, but just barely. Juliet is able to tell Sawyer she detonated the bomb by hitting it with a rock. Sayid’s wounds are too extensive for Jack to repair. Hurley tells Jack, Jin, and Miles that they must take Sayid to the Temple per Jacob’s orders.